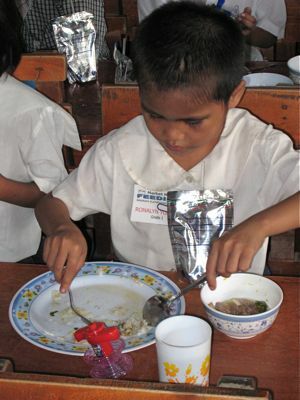 Seventy-five children are taking part in the Markemanila, reader-sponsored, public school feeding program at the Banawa Elementary School. 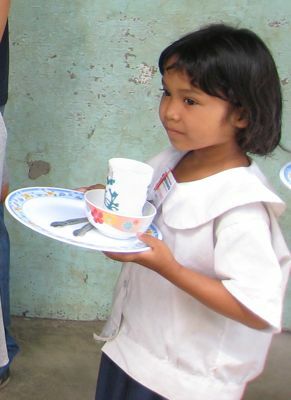 This supplementary feeding will run three times a week, from now until school ends in March 2008. 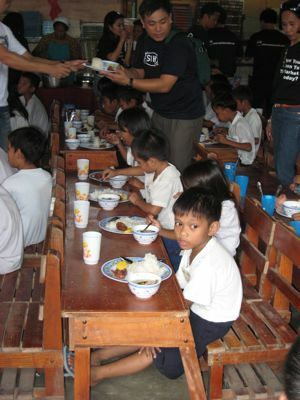 We had our first feeding last Monday, December 3, 2007 and I flew to Cebu to take part in the activities. Our familyâ€™s office crew set up a lot of the details before I arrived, and kudos to them for doing all of the advance work, including working with school administrators to identify the kids in the program and the many other myriad details. Marketman provided the school with a huge new automatic rice cooker, cooking utensils, as well as re-usable plates, bowls, glasses and utensils for the kids. The menu for the day included a vegetable and meat soup, fried chicken, rice and pineapple for dessert. A tetra pack of juice was added for the first dayâ€™s event. 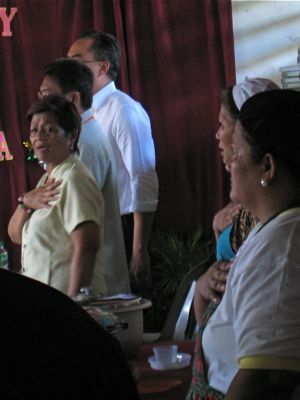 Frankly, I thought this would be a simple affair, but as always, Pinoys can really make a fiesta out of anythingâ€¦ and if there is one thing I donâ€™t normally enjoy, itâ€™s impromptu speechesâ€¦ and attempted in the Cebuano dialect, no less, YIKES! Amused with the lighted musical spinning top, but first, finish everything on the plate! And many went back for seconds! Several of Marketman’s family office crew that came along to help. So much of the detail work was done by them. And most of the photos here are taken by my crew. Daghang Salamat! Congrats, MM! Now you’re anonimity is partly unleashed (kidding). More power! Good karma to you and your very generous readers! A BIG many thanks to your crew as well!!! I think the use of melamine plates and cups are well-thought of(promotes recycling…:) ) A well planned menu, it seems…this is so heartwarming. Congratulations MM and to all the readers/contributors of this blog. Congratulations, MM. Keep it up. May GOD bless you always! MM, i’ve been off the grid for while so it was really nice to get online and see this. My mother in law has been part of a feeding program at Payatas for years now and i know this really make a huge difference in these kids lives. If you are thinking of making this a long term project, Im sure there are many who would give again, and a hardy few who could actually help you fundraise — ftom other individuals and of course, corporations — and keep track of the project. I would give again in a heartbeat. Oh, and I had my bunch of little brown books picked up by someone else since im out of the country, but she didnt take note of the date and just went and picked it up :) i guess it was okay with them bec i just got an sms that they’re all waiting for me at home for when I arrive. Yay. Good job MM plus everyone who helped! I’m speechless! MM,may you,your family and crew and everyone who made this all possible receive all the blessings you so deserve! Keep up the good work! Congrats and my heartfelt admiration to everyone part of this feeding program…as well as to all those un-known (like Myra’s mother-in-law and many I also know) yet still doing the most they can do for their fellowmen! The Christ(in)mass spirit is always with you! A job well done. Congratulations!!! MM, You have a liftoff!!! Bravo! Congratulations, Marketman! I’ll try to catch you tomorrow. Thank you for giving us an easy way to bring some comfort to a child or two. (I know we should give even when it isn’t easy. But thank you for making this easy).) God bless you, your family, and your crew. Myra P, I hope that your trip is filled with reminders of God’s faithfulness. God bless you and your family, too. congratulations. yes, education is important. i wish to also do something like this in the very near future! It is very beautiful to see people sharing what they have. Thank you for doing this, MM… plus of course, everyone else who made it possible. Hopefully, when you have a means of being able to collect from your overseas readers, you’ll be even able to do more. I’d love to be part of this but unfortunately, don’t have anybody available to forward my donation for me. Next time, gagawan natin ng paraan. God bless you all and your ever-faithful crew, donors, readers, atbp. Kudos to you, MM and your crew!Ã¼ It’s so heartwarming to see the kids enjoy. God will reward you with blessings you deserve (and more!). God bless you and your family! You an inspiration across oceans. 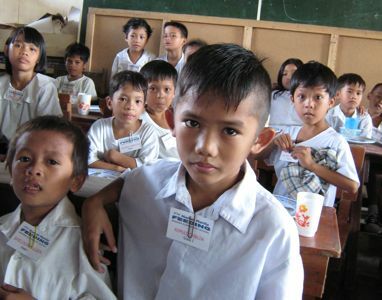 If anyone is aware of a good Filipino charity that balikbayans can get involved in or donate to, please post! you are so inspiring. God Bless you. MM, you’ve really got your ear to the ground huh :P Thanks for the well wishes, I also hope things turn out well. Gabriel, thank you too. 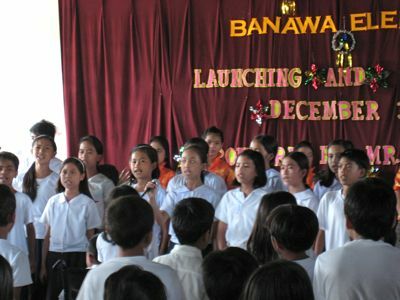 Will you be interested in helping a parish in Malaybalay, Bukidnon? A Jesuit priest (and my former high school teacher) is in charge of a parish and a school there. He has some urgent projects (building chapels and a classroom; also needs funds for dormitory assistance for tribal Filipino scholars). No non-profit org here. No receipts for tax-deductions. Just plain sending money directly. Email me at marymount_mba@yahoo.com. Ang galing! Who would have thought a blog could lead to this? You may have a future leader, scientist or doctor in this program. This is totally awesome! Congratulations MM! May God bless you and your family always, and also those who made it possible for this project to succeed. Congratulations! What you have been doing for these kids is awesome. May your tribe increase! God bless you and your family. Thank you so much for personally gracing the opening day of your program and giving an inspirational and encouraging keynote speech to them. Now they know who is behind this worthy program. You will forever serve as the kidsâ€™ role model! When kids run into you in their matured age they will recognize and thank you for your worthy cause. So 17 years down the line do not be surprised while crossing the street of Cebu someone will greet and pay their due respect to you! You and your crew have a great event planning career! Big hands go to Edik and Artisanal Chocolatier for putting forth their valuable time to make this roll out an event more memorable. Congratulations and Thank You to you and your staff! felt good reading this. thanks MM!!! Congratulations! congratulations! so happy to finally read your post on it =) thanks MM for the opportunity to help out. congratulations MM my batch mates from Cebu Science High do health related charities around Labangon area. just to give something in return for we have been lucky to have free education… hope yr program will do well which am pretty positive. congratulations, marketman and everyone involved, you have started a perfect ripple effect that will touch many lives and serve to inspire others. we need more people like you, leaders and trailblazers who will pave the way for more projects like this. congrats MM! 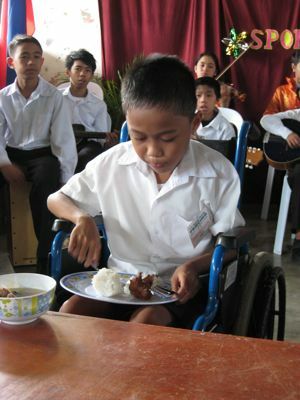 If you ever decide to do do a feeding program here in Manila I’d love to volunteer and help out. Awesome, MM! Awesome, indeed! May God bless you and your family and may He continue to inspire you in spreading these wonderful and kind deeds! Keep up the good work! Congratulations to all! This is what christmas is all about – sharing and taking a time out in your busy schedules to help others! I’m sure that this will make a biG difference in their lives! God Bless you! Thanks for sharing the pictures MM! Thanks for helping us pay it forward. Wow! I know the kids and their families are really grateful for this. I studied in a public school during my elementary years and saw school and classmates who go to class hungry. This will help them a lot. Got the tote(autographed by mm himself and the last extra brown book, yay!) last saturday. Was awestruck at meeting you in the flesh!! Thanks for being so gracious with giving me and Jen a lift to magallanes. So to you Marketman and your crew: Daghang salamat kaninyong tanan!!!! May God shower you with more blessings to share with the less fortunate. Good work, good thoughts and kind hearts are always rewarded by the Lord. Congratulations. i just like to ask if you still opperate this kind of charity works? do you have any activity this coming December? i’m a student, and our org are looking for a partner for our activity this december, which is a charity work. What are your Top 10 Pinoy Desserts/Sweets/Delicacies??? Cast your vote!! !